Moscow court does not have request for imprisonment of Navalny | Russian Legal Information Agency (RAPSI). MOSCOW, July 11 (RAPSI, Yevgeniya Sokolova) – Moscow's Simonovsky District Court has not received an official request from Russia’s Federal Penitentiary Service seeking to change suspended sentence for Russian opposition politician Alexey Navalny to imprisonment, the court’s press-service told RAPSI on Tuesday. “Document related to Navalny was returned to sender due to lack of signature,” representative of the court said. 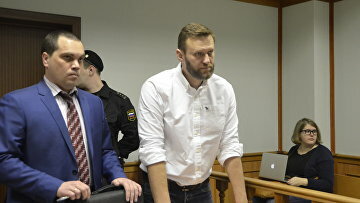 Earlier it was reported that the court received a request from a Moscow department of the Penitentiary Service seeking to toughen punishment against Navalny in relation to the Yves Rocher embezzlement case. In December 2014, Alexey Navalny was given a 3.5-year suspended sentence in Yves Rocher case. His brother Oleg received a 3.5-year prison term. They were convicted of stealing nearly 30 million rubles (about $526,000 at the current exchange rate) from two companies, including Russian affiliate of Yves Rocher. The term of Oleg Navalny is to expire on June 30, 2018. 19:27 11/07/2017 Moscow's Simonovsky District Court has not received an official request from Russia’s Federal Penitentiary Service seeking to change suspended sentence for Russian opposition politician Alexey Navalny to imprisonment.